Homity Pies are a wartime speciality traditionally made with shortcrust pastry. 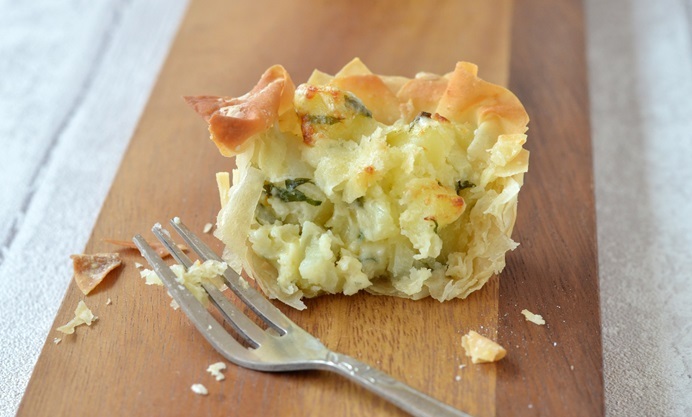 For a special treat try these mini and lighter versions using filo pastry for the crust. Many moons ago, during my late teens, I worked in a travel agency. Whilst working there a health food shop opened up down the road. Obviously being young and naïve, myself and my fellow co-workers believed that every item of food sold in this new health food store was healthy, and of course good for us, in whatever quantity we ate it. We particularly liked their Homity Pies, which would be warmed up in the microwave and served in a paper bag. Whenever we felt peckish we would nip down for one of these garlicky potato pies encased in a thick wholewheat pastry. Needless to say the pounds began piling onto all of us – did I mention the amazing cheese and onion granary baguettes that the nearby bakery sold, or the jumbo bags of salted wheels that had no calories printed on the bag so we deemed them ‘calorie free’ and ate them by the bucket load. Anyway, back to the Homity Pies, which I believe came about during war time rationing in the second world war. 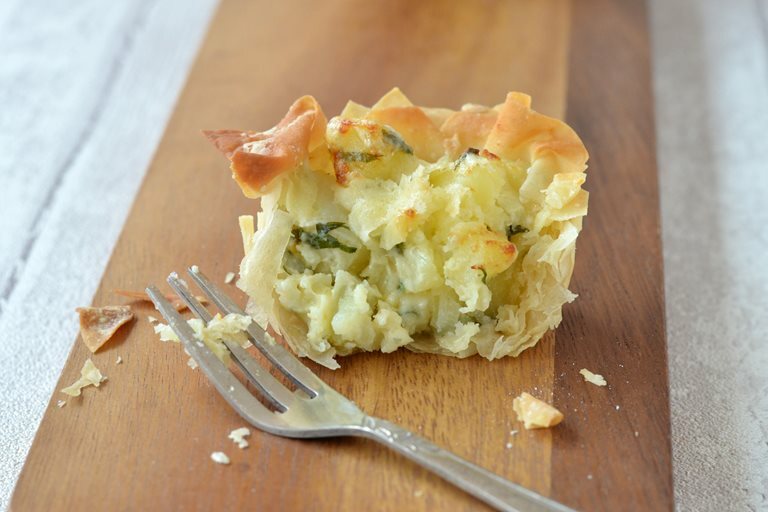 They are traditionally made with a shortcrust pastry and filled mostly with potato. I decided to make a mini and lighter version of these pies using filo pastry for the crust. Of course, they do still contain a little cream but you could replace this with milk to cut a few calories. Don’t, whatever you do, cut out the mature Cheddar though, as this compliments the potato perfectly.